1x drivetrains should only have a shifter on the right-hand side, for the rear mech, in my opinion. I mean, otherwise you have pointless machinery cluttering your cockpit, right? On a mountain bike you just take one shifter pod off, but converting Shimano road levers to a 1x does involve removing a shift paddle, in my books. The internets would suggest that no one has ever tried this. Removing the shift paddle from the left hand shifter is actually remarkably simple, takes about 10 minutes, is reversible and leaves you with only a tiny bit of brake lever play. 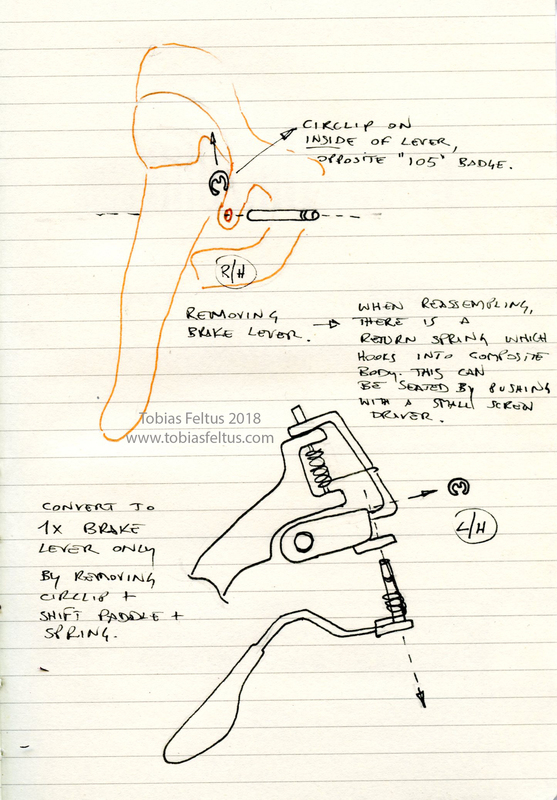 Remove brake lever assembly per Shimano’s instructions (see illustration), which involves moving a circlip from the inside end of the shift pivot pin: I used a flat object like a butter knife to raise the clip, then push or tap out the pivot pin. Removing the lower shift paddle involves the removal of another circlip, then it all slides out. Reassemble the brake lever, and the job is done. There is a lever-return spring which you may need to hook into its little hole on the composite frame, but I found this to be pretty easy with a small flat-blade screwdriver.